You can buy the cake, wedding rings and flowers in Costco for a wedding, but now add the ceremony to the list. A couple was married in San Diego's Mission Valley Costco Thursday morning. 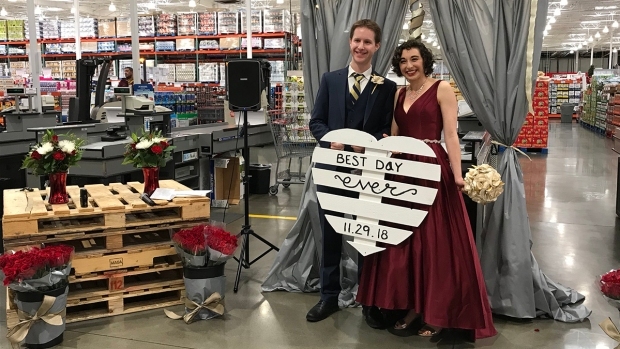 It's a special place for bride Margot Schein and groom Julian Parris: The two went on their first date at that Costco. "It was three years ago to the day today," said Schein in her wedding dress while holding her bouquet. "We technically met online, but I only messaged him because he had Costco in his profile." The couple said their vows in front of an intimate gathering of their friends and family at the checkout cash registers in the store. Dozens of Costco employees watched from behind the family, some filming and some holding back tears. 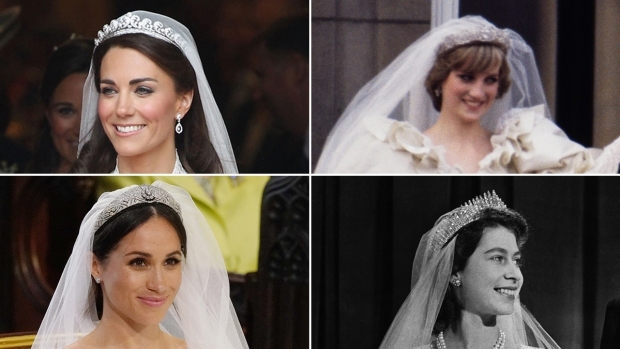 "We have so much in common, but Costco is the first thing," the bride said and laughed. The couple, also fans of Harry Potter, wore their respective house colors. Schein had a scarlet dress with gold flowers (made from pages of the books) for Gryffindor. The groom had a blue and bronze tie for Ravenclaw. 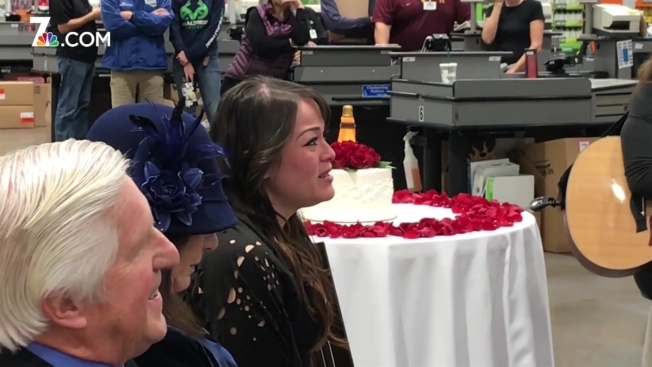 After the ceremony, a one-layer white Costco cake was cut, and the couple was presented with a decorated champagne bottle fresh off the shelves as a congratulations from employees. The two also received Costco nametags. The couple then browsed the aisles together for the first time as man and wife. "On our first date, we got pizza and hot dogs and then spent an hour walking around," Schein said. "It was just such a good date." The groom holds a Ph.D. in psychology from the University of California, San Diego. The two moved to North Carolina a few years ago so that Schein could pursue her master's degree.